But the big question is besides doubling your full circle weight crankshaft inventory what benefit (or cost) could this possibly have for horsepower and torque? Simple. Putting the T weight in the rear of each cylinder allows a significant more amount of airflow from the lower end of the crankcase into that rear transfer port and up to the combustion chamber where the magic happens. (See photo) To see this, set a full circle crankshaft into a block and see how restricted the rear transfer port is by the full circle weights. Now do the same with the T weight standard crankshaft and you can clearly see the increased airflow you will have to the rear transfer port. Remember the Saab two-stroke engines are very deficient with transfer ports. Most modern two-stroke engines have at least five transfer ports where the old Saab two strokes only have two. Back in the old days all two-stroke tuners “stuffed” the low end to get a higher compression ratio. Today most two-stroke tuners try to get more AIR into the lower unit. The first question I’m asked by everybody is “won’t the crankshaft be out of balance and shake the engine terribly? ?” The answer is unequivocally no. Remember each section of the crankshaft is its own little unit so it’s balanced by virtue of one T weight and one full circle weight each being equal in weight to the other two cylinders make up. This makes the balance issue a non-factor. I have assembled two Hybrid crankshafts into two different engines. Neither have any vibration issues. And now the best part is you have increased horsepower and torque in your lower RPM ranges. On the car I am currently testing the hybrid crankshaft in, the horsepower and torque curve don’t meet/reverse till 4,000 RPM’s, and anytime I’m below 4,000 RPM’s I have a dramatic increase in horsepower and torque. Once you exceed 4,000 RPM’s the two lines come together and there’s a very slight difference in horsepower and torque. (You can see this on the charts but it is really not noticeable driving).See the chart HERE. Like any new idea this will take more research and everyone will have to do their own testing and decide for themselves. But any Saab that requires a change of gear would seem to me to benefit from this combination. I know on my own personal cars I don’t think I’ll ever build another full circle crankshaft. (Whoever builds your crankshaft for you can easily do this combination, as it takes no special skill or tools other than what they already have). The driving characteristic of the Hybrid crankshaft is just too much of an improved over a Full circle crankshaft, which has no low-end torque. Anyone that has driven a Monte Carlo or a GT knows what I’m talking about. Get on the gas below 3500 RPM’s and the engine will totally fall on its face. Those concerns are gone with a hybrid Crankshaft. And you can tell by looking at the charts that the upper RPM loss of torque and horsepower is so insignificant that for most driving conditions it’s simply not a factor. Most people drives their car between 2,500 to 4,500 RPM’s, and in this Power Band range you will see a very small difference in horsepower and torque loss on the upper end but that huge increase on the low side that really makes the hybrid crankshaft a winning combination! My test Specs are as follows. All testing done in Fort Dodge, Iowa (Elevation 1,156 feet) in 4th gear on a Mustang Chassis Dyno with Eddie brake and Weather correction factors (WCF) used. Tire pressure at 45 PSI. The test vehicle was Larry “Stoker” Williams “Get-A-way” car, a 1961 black 96. I ran the full circled crankshaft first and then swapped out just Hybrid crankshaft using the same pistons and rings and did not remove the head or carbs. The test engine was a GT block #716503, (850CC), Oil Injected (Red Line Synthetic), GT Head Cast# 716508. The engine block had stage II porting in it and was fitted with Domed 71mm Wiseco 4032 alloy forged pistons with two Keystone rings and skirt coatings. Cylinder compression test where done after every two Dyno runs. (They consistently measured 121 front, 122 middle and 123 PSI on the rear cylinder) I am using the Saab original Solex independent GT triple carburetors with factory air cleaner. Carb jetting was 122.5 front, 125 middle, and 122.5 rear main jets. Emulsion jets were 220, 210 and 220 respectively. 91 octane fuel with OUT ethanol. The exhaust system is a Monte Carlo/GT dual front expansion chamber/muffler and dual pipes all the way back with cherry bombs on the rear. The transmission is a 5.14 ratio gearbox with .84 overdrive. (Standard GT gear box). Timing was set at 20 degrees BTDC or 22 degrees BTDC (all fixed). All the runs ran from 1,075 degrees EGT temp to 1,175 degrees. (Varies with timing setting). Keep in mind I’m running a stock Monte Carlo/GT dual outlet front muffler and the power band starts about 4,000 RPM’s on these. If you use a modified chamber with a higher RPM power band, the power band curve should follow it upwards in RPM’s in similar fashion to my tests. So if you drive your Saab slow, or like a RALLY driver, this Hybrid crankshaft might be just what the doctor ordered. On the excel spreadsheet it lists each Dyno run, which crankshaft was used and then the starting MPH speed of the test (and end). The timing is listed as I did experiment with it. The first HP and Torque listed are the STARTING reading at the listed RPM followed by the ENDING RPM and then the HP and Torque readings. Any run # with an “a” after is the same run at a different RPM range to aid in comparisons. Some readings are closer than the example I have shown but I tried to look at the overall averages and internal notes I have for each run to get compatible tests. 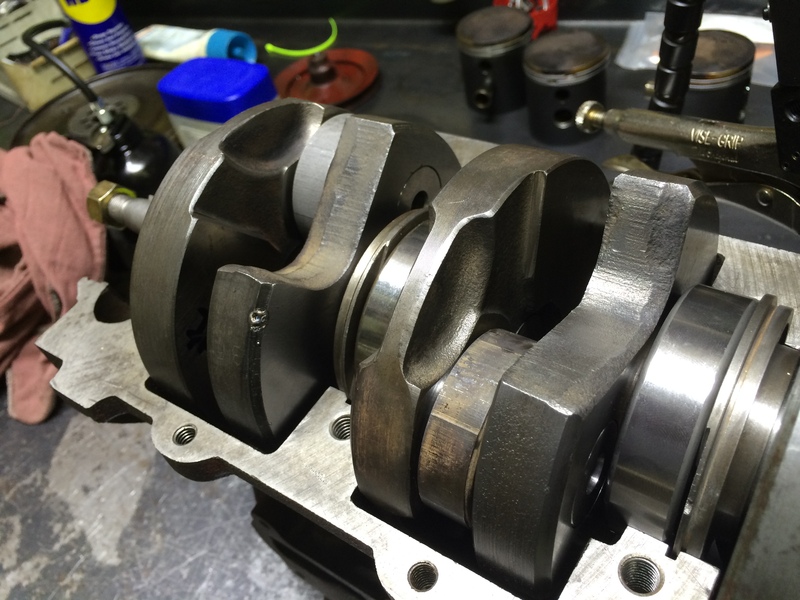 I have also tested the Hybrid crankshafts in one of my Bonneville engines with extreme porting. However the low end gain is just not needed at Bonneville since we push start up to speed and take off in 3rd gear. We run from 6,000 to 8,000 RPM’s and losing even 1HP there is not worth it….yet :). However next time I test, I will take a lower engine case cover 1/2, and fill it with epoxy to “stuff” some compression back into the lower end. My guess is this will result in ZERO loss (perhaps a gain too) of HP and Torque at ALL RPM ranges while still keeping the great gains the Hybrid crankshaft delivers on the lower RPM’s. Then it will be ready for Bonneville! !